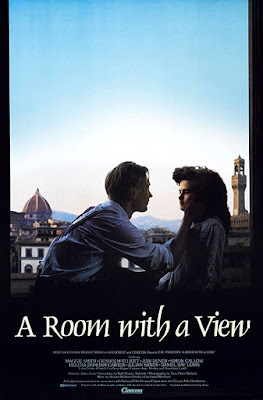 Though I'm not a Victorian fan, I've been wanting to watch A Room with a View for a very long time. The cast is marvellous and the film got eight Oscar nominations, Best Picture included. 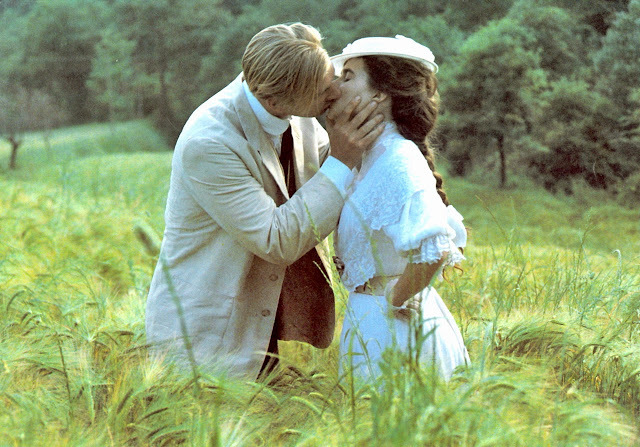 If I had known it was directed by James Ivory, the same guy who wrote the screenplay for emotionless Call Me by Your Name, I would have never watch it. It's the Edwardian era. Lucy Honeycurch (Helena Bonham Carter) is a young English woman spending summer in Florence, Italy, with her chaperon (Maggie Smith). There, she meets George Emerson (Julian Sands), a young free-spirited man. She is intrigued by him, but once she's back in England, she is supposed to marry the wealthy and stoic Cecil Vyse (Daniel Day-Lewis). When George reappears in her life, Lucy must decide between him and Cecil. It's a very basic and generic romantic plot, your typical boy-meets-girl kind of Story, only there are two boys instead of one. That's good, after all, it adds conflict and makes it more interesting. No, actually, it doesn't. There's nothing interesting, charming or sweet here. It's just a predictable and rather unengaging story. It deals with many important themes such as feminism and socialism and shows the factors (culture and wealth) that affected a woman's independence and freedom but it's just dull. The pacing is also terrible. It moves so slowly that its almost two-hour running time feels like an eternity. And the dialogue, which the writer picked over story developmnet, is so unengaging and tedious. The characters are just another element of A Room with a View that I didn't like. The main characters are well defined, I'll give the film that, but they aren't interesting and I just couldn't care less about them. Also, Cecil is nothing more than a plot device whose only purpose is to drive the story to the predictable ending, and he's pretty much just a stereotype of a snob English man. And the cast is quite a disappointment. Other than Maggie Smith who is outstanding as Lucy's passive-aggressive chaperon and Denholm Elliott who is just as good in the role of George's father (those two Oscar were deserved), the cast isn't that good, especially Helena Bonham Carter and Julian Sands. They aren't that believable I guess that's why the romance was so tedious. But it's not all bad. If there's something A Room with a View can brag about is its look. The scenery is just beautiful, the cinematography is gorgeous and the costumes are marvellous. The music is also very beautiful.